This is my second attempt at making these awesome allergy friendly rolls. It’s actually my second attempt at making rolls ever! These are damn good. I’m going to continue to tweak them- maybe try with some heavier flours and see how I like them. They’re super easy and the best gluten free roll I’ve ever had. The first time I made them I used all starchy flour (asian rice flour, sweet rice flour, & potato starch) and the full amount of yeast. They were too gummy and yeasty for my taste. Other people liked them, but I wanted to try the recipe a little differently. Warm your milk in a medium sized bowl. Whisk in your sugar and yeast. Let is sit undisturbed for 8 minutes. It should get foamy on its own. In a large bowl, whisk together all of your dry ingredients (flour, xanthan, salt, baking powder). Mix in your flax mixture, yeast mixture, melted butter, honey, and the vinegar. I don’t have a stand mixer at home and my handheld mixer couldn’t handle this job, so I did it by hand. Mix all of the ingredients getting the lumps out. Mix it (either with your mixer or by hand) for 3 minutes. It’s going to change from a thick pancake batter, to a loose dough. Spray two muffin pans with your favorite gf spray (I found one that is soy free as well… 5 bucks, but it’s worth it). Take a tablespoon and spoon the batter/dough into the pans. About 3/4 full. I turned my oven on at this point. Cover your rolls with a clean cloth and let them rise in a warm place for 35 minutes. I put my pans on top of the stove top so that the heat from the preheating oven helped them rise. Works perfectly! After 35 minutes, put your rolls into the oven. Bake them for 18 minutes, until they are golden brown. Remove them from the oven and let them cool in their pans for about 15 minutes. They will hold their shape better if you do this. After 15 minutes, moves the rolls onto a cooling rack and let them cool. The recipe above made 18 rolls. Eat these bad boys any way you’d like: plain, with jelly, smothered in nut butter, with delicious honey, stuffed with ham… Mmmm. Instead of using eggs I used 2 Tablespoons of ground flax seed whisked with 6 Tablespoons of super hot water. I let that sit for the same amount of time that the yeast was proofing. I used half coconut milk and have rice milk, because I ran out of rice milk. I used the soy free, dairy free Earth Balance butter. Instead of tapioca starch I used white rice flour. I only used one package of yeast (about a tablespoon). As much as having new dietary restrictions has been a pain, it also adds a new level of excitement and creativity into the kitchen. I’ve been scouring the web for recipes that look good and have great reviews. It’s always scary attempting a new recipe for the first time, mostly because the ingredients are so expensive! It has nothing to do with the fact that I have a ridiculous sweet tooth, promise! I found this recipe online and fell in love with Jennifer Kelly’s blog: Cinnamon Quill. I made a few minor adjustments, simply because I didn’t have some of the ingredients in my pantry. Make these. You won’t regret it. Get a baking sheet ready lined with parchment paper. Whisk together all of your dry ingredients in a large mixing bowl. Stir in your wet ingredients until well combined. I used a large spoon. Mix in your chocolate chips. Let the dough rest for about 10 minutes. Roll the dough into balls, about 1.5 inches wide. Place them onto the baking sheet 2 inches apart. Bake for 10 minutes and then remove from the oven. They will be slightly golden brown on top, but the bottoms will be darker so you have to be careful. Let them rest on the baking sheet for a few minutes and carefully move them to a cooling rack. My dough looked and felt oily, but they turned out great. Next time I will make them with just a straight 1/4 c of oil. If you haven’t stopped by thecinnamonquill.com , you definitely should. She has some recipes that look delicious. If they are anything like her cookie recipe, you will not be disappointed. 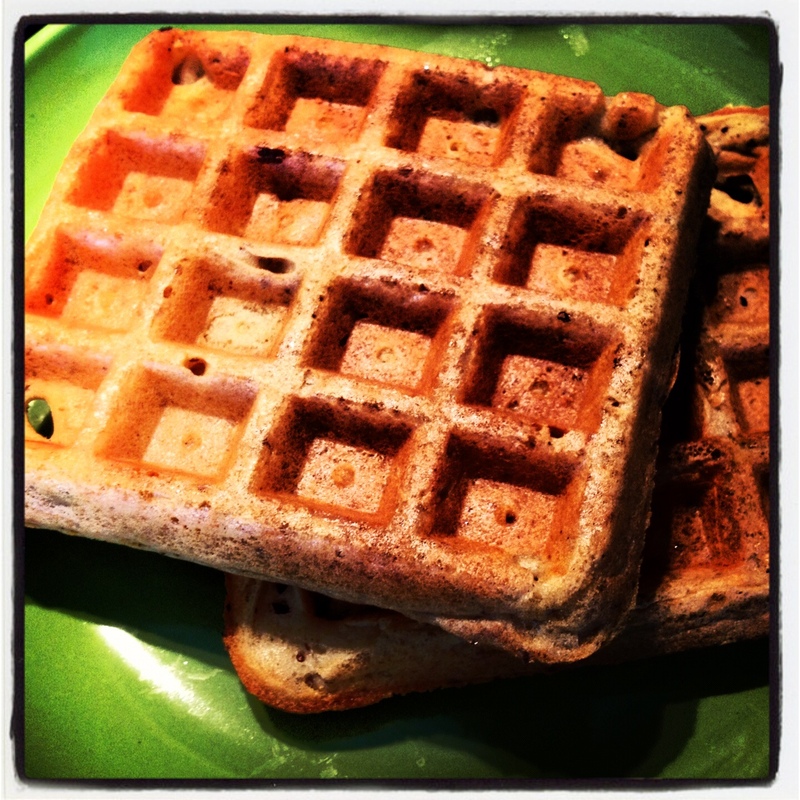 Turn your waffle iron on so that it’s ready to use when your batter is finished. Make your flax slurry (6 Tbspns hot water whisked together with 2 Tbspns Ground Flax). Stir it occasionally but let it set up for about 8 minutes. It looked like the consistency of whisked eggs when it was ready. You will use it all, without straining it. In a separate smaller bowl, whisk together your dry ingredients. Whisk in your flax slurry when it’s ready. Whisk your wet ingredients into your dry until everything is incorporated. 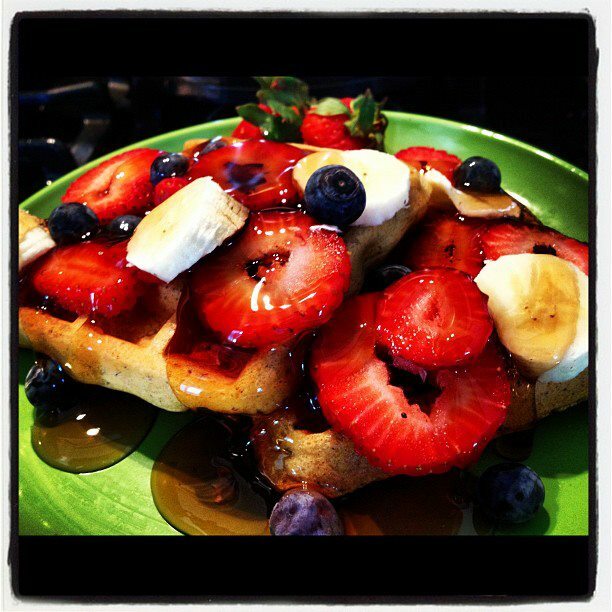 Scoop the batter into your waffle iron and cook until they are golden brown. I used a heaping 1/4 c of batter, but it may vary depending on your waffle iron. Three years ago I learned that gluten was my tummy’s enemy. About a year and a half ago, I realized that dairy was not my friend either. After cutting both out, I still had tummy issues. Not fun. Not fun at all. I’ll spare you the details, but I’ve visited numerous doctors and with no success finally went to my second complementary medicine/naturopathic doctor. He was very helpful and had me take a food allergy test that came back full of life-changing news. In addition to gluten & dairy, I now also have to completely avoid: eggs, soy, peanuts, pecans, beans, & garlic for at least 6 months. This throws quite the wrench into my baking. No eggs? AND so many dairy free alternatives are jam packed with soy. Booo hiss. Now, I don’t want a pity party. This gives me a good excuse to bake creatively. 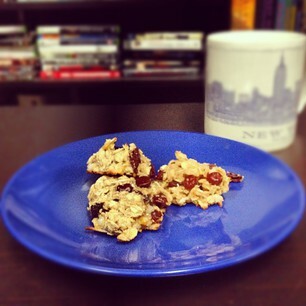 I’ve tried to make 3 different baked goods (brownies- fail, chocolate chip cookies- decent, oatmeal raisin cookies- yum!) in the past two days. 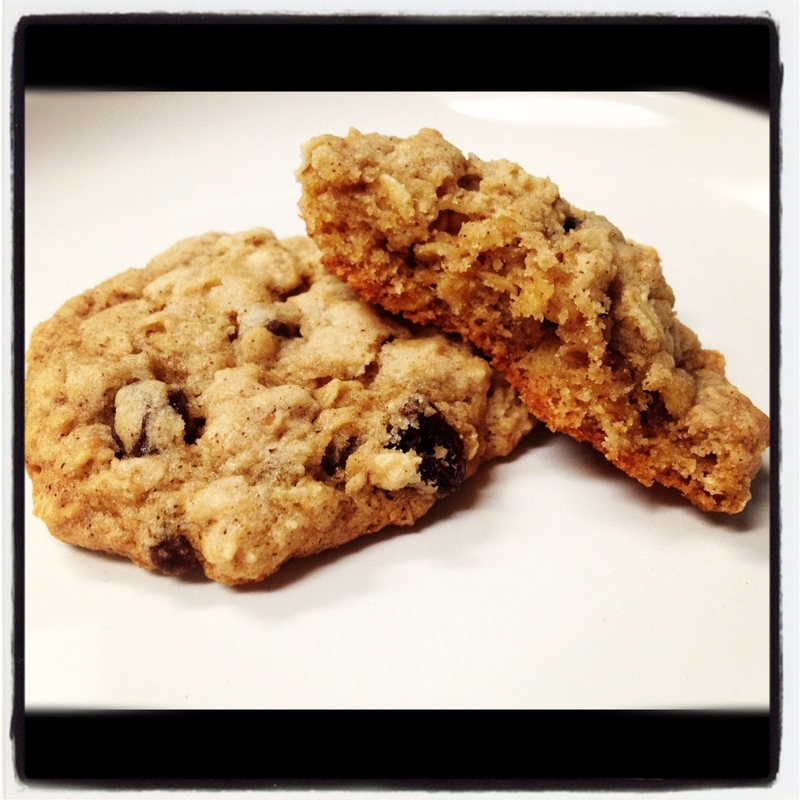 I used this Oatmeal Raisin Cookie recipe from Gluten Free Goddess. I followed her directions and ingredients almost exactly, however I made the following substitutions: instead of 1/2 c brown rice flour I used a 1/2 c of white rice flour, instead of 1/2 c potato starch I used 1/2 c sweet rice flour, and instead of the 1/4 c vanilla powder I used 1/4 c brown rice flour. I also added about 1/4 c of allergen free chocolate chips- why not, right? These cookies are very similar to what I remember an oatmeal raisin cookie tasting like. YUM! The bf and I had a few friends over for dinner tonight- we had burgers on the grill with all the fixin’s- to celebrate Spring Break. I struggled to come up with a fun dessert that was “springy” and wanted something other than a cupcake or cookie. Luckily, my addiction to Pinterest lead me to the most beautiful cheesecake. I didn’t care that it was full of gluten and dairy and all things that would make a night full of friends a pain in the tush (no pun intended). I decided I’d make a gluten and dairy free version that everyone (including myself) could enjoy. The creator of the original cheesecake took beautiful step-by-step photos and I highly recommend popping over there to check ’em out! I topped mine with homemade raspberry topping, but you could use store bought jam or fudge or homemade caramel… Whatever floats your boat. Now, dairy free substitutions are ridiculously expensive (um, yes I spent almost $40 making this cheesecake), but if you can’t tolerate dairy- you do what you gotta do. If you can have dairy, I would just use good ol’ cream cheese and sour cream that comes from a cow… It’ll save you some money. I’ll be completely honest, the crust was my least favorite part of the entire cheesecake. I will add less flour or more butter next time, as it was a little crumbly. However, I’ll post it the way I made it because it still tasted delish. If you change the crust and find something that works better, please let me know 🙂 Thanks, friends. In preparation for the Filling: In a small saucepan, heat your soy milk and prepared vanilla bean (first cut the vanilla bean, scrape out the goodies and whisk them into the milk- then plop the whole thing into the milk) over low until it’s warm. Remove from heat and let it cool down while you make the crust. 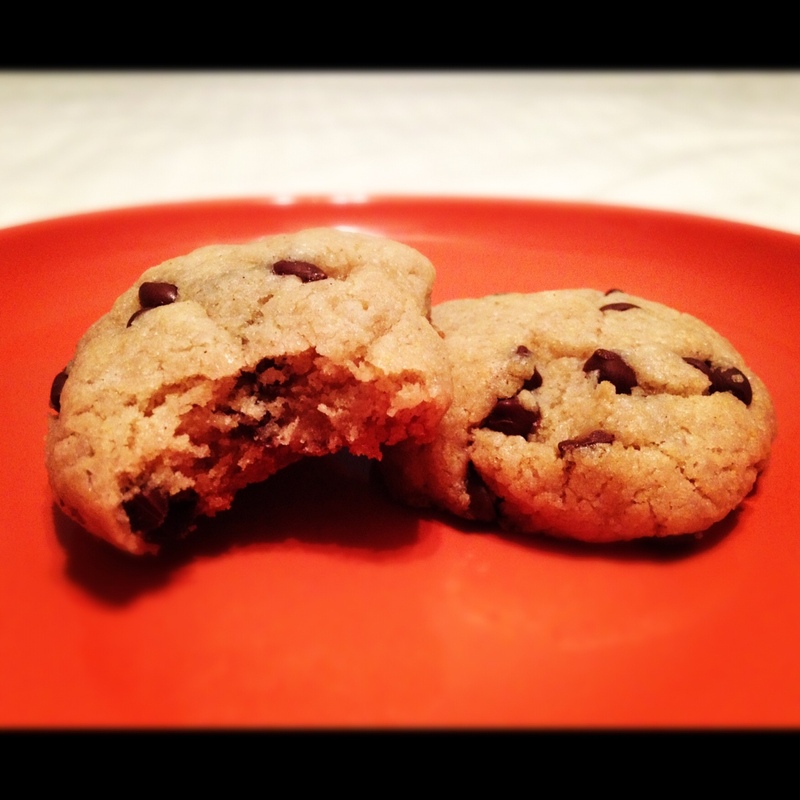 Crust: Using a food processor, crumble your cookies until they are very fine. You’ll notice I used two different types of cookies- this is because there weren’t 4 cups work of crumbs in the two boxes of cookies I had originally bought. The graham crackers were the only other cookie I had on hand. Once you have fine cookie crumbs, dump them into a bowl and only put 4 c of the crumbs back into the processor. You can store the leftover crumbs for another time. Add the 1/2 c sweet rice flour to your processor and pulse until it’s combined. Pulse in your melted butter until you have a mixture that looks like wet sand. Cover the bottom of a 9″ springform pan with foil. Then dump 2 c of the cookie mixture into the pan. Press it down firmly, covering the bottom. After you’ve done that, carefully use the rest of the cookie mixture and press it up the sides of the springform pan. 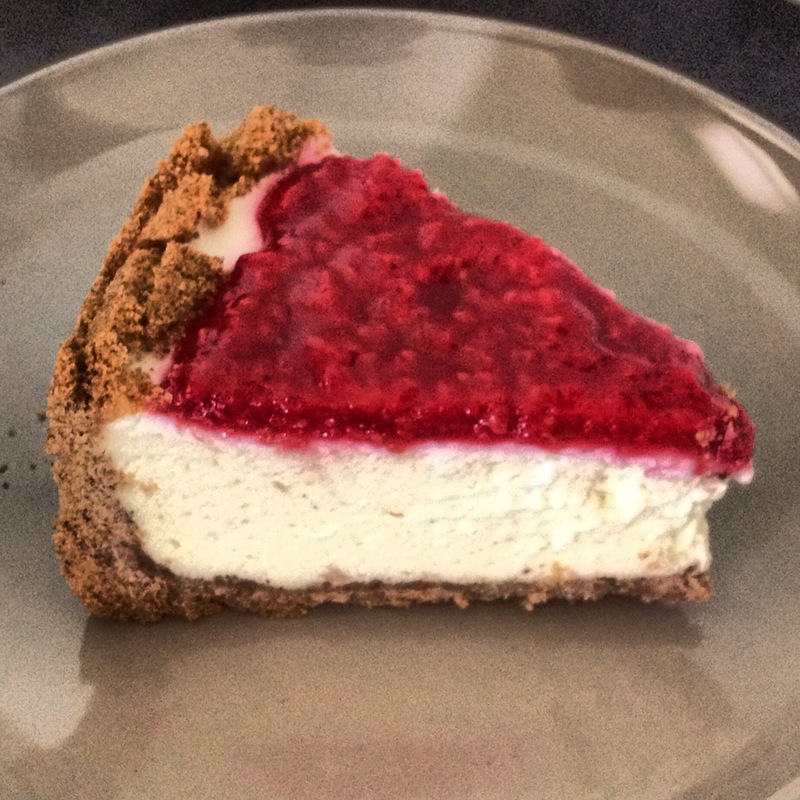 You want a wall and floor of crust on your cheesecake, because number one it looks gorgeous and number two it tastes amazing.You do NOT need to prebake your crust! I repeat, do not stick your crust into the oven. Filling: In a large bowl, cream together your dairy free cream cheese and sugar until it is smooth- No lumps!!! Scrape down the sides and when everything is nice and smooth, add an egg and mix until it’s fully incorporated. Stop. Scrape the sides. An an egg and mix until it’s incorporated. Repeat will all 4 of your eggs. When you’re done adding the eggs, you can mix in the vanilla infused soy milk. Don’t over mix. Pour your filling into your prepared crust. Put your springform pan on top of a baking sheet in case any dripping occurs (I didn’t have any problems, but better to be safe than have a hot mess in your oven). Carefully put your cheesecake into the oven and let it bake for 1 hour or so. I had mine in the oven for probably an hour and twenty minutes. You want the sides to be set and the middle to still be a little soft/jiggly. Creamy Topping: Once your cheesecake is done baking, take it out of the oven and let it cool for 10 minutes, but keep your oven on. During this time, make your creamy topping. Mix together your sugar, df sour cream, and vanilla. After 10 minutes, carefully spread the mixture onto your cheesecake and put it back into the oven for 10 minutes. After 10 minutes, remove the cheesecake from the oven and let it cool on a cooling rack for an hour. After an hour, you can put it into the fridge for at least 4 hours so that it’s cool. Don’t freak out- the middle will set when it’s cold. If you’re a procrastinator like me, and you don’t have 4 hours to let it cool you can put it into the freezer for a little while and that worked just fine for me. As I mentioned before, I put some raspberry topping on mine, but you could use whatever you’d like or you could just be awesome and leave it plain. Whatever you do, rejoice that you have a damn good gluten free AND dairy free cheesecake that you can share with friends or just eat all by yourself. This past summer I babysat a few days a week for one of the most amazing families. I would always go to their house in hopes that there would be home made pickles to serve with lunch. I will admit that I would sneak a few (or a dozen…) pickles throughout the morning and didn’t always make it until lunch. 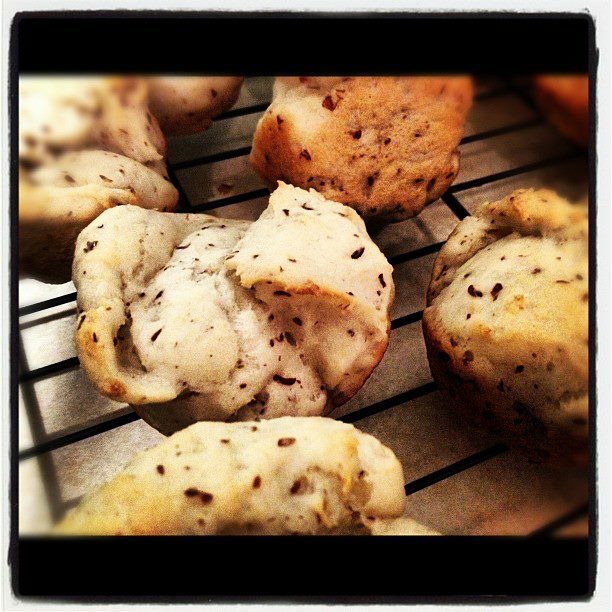 Angie (the amazing mom) shared her recipe with me and I make these bad boys now all the time. They’re super simple and super delicious! Chop up all your veggies and dump them, along with your celery salt, into a decent sized container that has a lid. The lid fairy likes to hide all the lids in our house, so I settled for a cookie jar. It worked beautifully and looked gorgeous to boot. In a medium saucepan, stir together your sugar, vinegar, and salt. Bring to a boil and then reduce heat to low. Simmer for about 5 minutes (or at least until your sugar looks dissolved). Carefully, pour your vinegar mixture on top of your veggies and stir. They might not all get covered at first, but it’ll be okay. I promise. Cover and put your soon-to-be pickles into the fridge. I always stir mine a few times over the first few hours to make sure that they all become submerged under the sugar liquid. 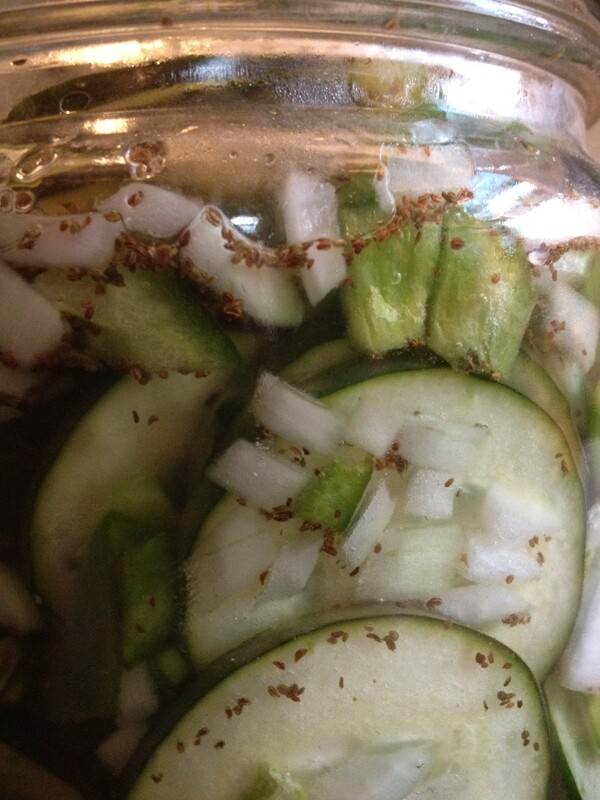 You can add freshly cut up cucumbers/onions/green peppers to your pre-made juice if you get low on your pickle stash. I tend to do this for a few days…. until I’m all pickled out. I’m addicted to Pinterest. If you’re not addicted yet, stay away. Looking at food and recipes is like a drug. Like that delicious bubble gum medicine you used to get as a kid… Yum! I found these cookies a few days ago and I just so happened to have a bunch of ripe bananas that had to be used stat. Don’t let the fact that they are vegan and gluten free scare you. They are a yummy, healthy cookie. With your handheld mixer, blend together your bananas, oil, and vanilla until relatively smooth- No big banana chunks, yo! In a separate bowl whisk together your dry ingredients (up through the baking powder) and mix them into your banana mixture until everything is combined. Stir in your chocolate chips, raisins and coconut. Line a baking sheet with parchment paper. Drop your batter by spoonfuls (I used a tablespoon) onto the prepared pan. I preferred it when I pressed the dough down a little (instead of leaving it as a mound). Leave about an inch of space between each. Bake them for 13 minutes. After a minute or two, move the cookies onto a cooling rack. I sprinkled mine with some raw sugar crystals just because. You don’t have to.